« Jenny WON the XGames AGAIN!!!!!! Last weekend Stef and I went for a weekend to Mayrhofen, Austria for the TTR3 star Skull Candy Sistasessions competition. The comp was really good fun, the sun came out and we all rode the course having some fun on the side on box or rail, flat down box or rail and then 2 kickers 12-14m long. The standard of riding was really high, there were spins of all directions stomped and local girl Tinni was busting out her bs5 which is all inverted and RAD! I managed to make finals by the skin of my teeth with a run where I crashed on my bs180 but made my fs3 stale and had a fs lip to fakie on the box and 5-0 on the flat down box. Ended up in 14th place and was really, really happy for it. Then there was a jam session on the box by the comp tent, it was brilliant fun, we’d been sessioning the small boxes with the locals the day before so had some new tricks to try outin this session, Stef was on fire with some siiiccckkk fs slides and some crazy spinny cab 270’s on, she won a whole new outfit of jeans, T and a hat and some more goodies too! so she was stoked! We stayed for the afterparty and then kidnapped Claire so we could show Avoriaz her fs7 haha. Off to Adelboden tomorrow for a Nikita Slope Comp which is part of the Nikiata Chickita Swiss Tour. 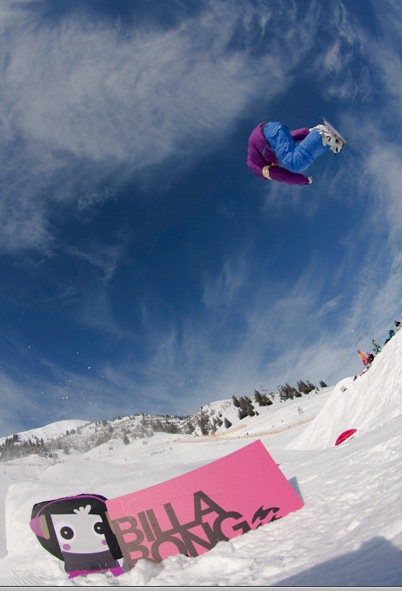 Pic from the Sistasessions of my fs3 stale, not sure why it looks upside down, must be their lens! 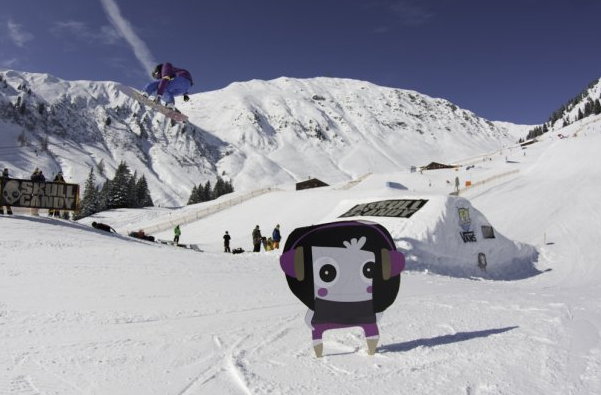 The snowy slopes of Mayrhofen, Austria glimmered in the sunshine as 50 girls from thirteen different countries gathered for the Skullcandy Sista Sessions. In one action-packed day the participants could join in on various activities: beginner lessons, small jam sessions and photo shoots, while the main focus was on the 3Star Swatch TTR Slopestyle competition. It was 19-year old up and coming ripper from Slovenia Urška Pribošič who deservedly took the top spot on the podium, while local Zillertal girl Chirstina “Tini” Gruber came in second and Claire Frost (GBR) in third. The title of best non-sponsored rider and a one-year clothing sponsorship with Billabong Girls went to the delighted Argentinean Chani Michaux who placed 13th. The busy chill zone featured a Christa Leonard photo exhibition brought to us by our sponsor Les Ettes and the popular waffle stand from Vans. Finally a “Hot chocolate Box Jam Session”, presented by Billabong, ended the day in style. We would like to thank all the girls who made the Skullcandy Sista Sessions a true success, not only by taking part in the competition, but also by creating such a friendly atmosphere, and pushing each other to progress. Big thanks goes out to our sponsors who made the event possible: Skullcandy, Mayrhofner Bergbahnen, Billabong Girls, Vans, Les Ettes, Sweet Dream and SMT Snowboard School. Watch out for our media partner magazine Cooler where you can soon read about the event and see exclusive photos! Video from the Skullcandy Sista Sessions will be online shortly on http://www.sistasessions.com while photos are already up the Sista Sessions Facebook Fan Page! Upload your photos of the day to the Fan Page and you may be one of the lucky winners of the “best photo” competition for the public.